I’m fortunate that I’ve more than eight rooms in my house. However, I’ve found it’s impossible to keep them all in order without being slavishly devoted to housework. As a result each room has taken on a life of its own. It lives, it breathes. Indeed, if you look closely at any room it reveals much about the occupants. For example, in my kitchen the stacks of plates piled with crusts, bottles without tops and towers of leaning glasses betray the presence of three hungry boys. In contrast, the dining room is the tidy showpiece of two mature adults moving towards old age and then there’s my study where I slip away into peaceful but rather chaotic solitude. 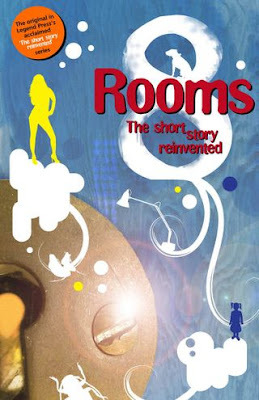 8 Rooms, a collection of short stories from Legend Press and part of their Short Story Reinvented Series, is the result of a competition where the objective was to tell a story principally within the confines of a singular room. It’s an interesting scenario which poses many questions. What can we learn about a character from their room? Does a room define a character or does a character define a room? What is revealed about the protagonist when he/she is alone or interacting with others within their room or maybe even in someone else’s room? So many tantalizing ideas spring to mind it’s not surprising that the eight winning authors have produced an eclectic selection of stories which rather like the rooms in my house paint entirely different pictures of their occupants. Of the stories I felt the opening one by C J Carver, which told the story of a prisoner confined to a rail truck and en route to his execution, was probably the most well rounded. It managed to pull sufficiently well at the heart strings, in what was quite a difficult and challenging subject, despite a rather cheesy ending where the narrative ended in mid sentence like an episode of a soap opera. The same sickness affected Emma Seaman’s story of the masseuse and the bachelor. Overall, this was a nicely written tale of two people’s mutual attraction but whose inhibitions prevent them from vocalizing their feelings. Unfortunately, after a 30 page build up I felt a little disappointed that there was no shock, sleaze or even a twist in the tail that might have set this story apart from so much of the sentimental fodder that appears in women’s magazines. Frankly, I would have been glad if one of the protagonists had been shot like JR in this story because, let’s face it, a real cliff-hanger is better than a wishy-washy “maybe they will, maybe they won’t” scenario. Something entirely different and completely refreshing was my favourite story from newcomer Guy Mankowski. A trained psychologist, Guy used his knowledge to delve into the mind of a translator obsessed with the ownership of the space and people around him. With its explicit language this isn’t a story for those looking for a comfortable read but for a glimpse inside a mind descending into mental illness it's quite intriguing. Guy’s position gives him a unique insight into the oddities of human behaviour and I look forward to seeing what he delivers next. Regrettably, I don’t feel the same about D E Rhylis whose story about the sudden death of a mother, seen through the eyes of her daughter, left me completely unmoved. As my own mother died suddenly and dramatically last autumn, I probably should have ended up weeping profusely but, sadly, the story didn’t fully explore the real issues of personal loss. Ironically, it actually skirted over them by featuring too many characters, events and details. By trying to achieve too much it actually achieved very little. In my opinion, to portray love and loss you don’t need to catalogue a series of events as evidence of your distress, you just need to strip away the detail and write from the heart. I’m not sure that D E Rhylis’ story could even have been saved by some careful editing but like most of the stories it would have certainly benefited from the slash of a red pen. I suppose this raises the question of how much or little an editor should or would want to play in nurturing a writer. 8 Rooms was the result of a competition so I suspect the stories had minimal editorial input which is rather a pity because like actors on a stage, an author can sometimes benefit from good direction. And when there’s a price tag attached the ultimate objective must surely be to make any piece of work the best it can possibly be. I felt this was particularly the case with A J Kirby’s story. It started out witty and entertaining with the premise of a geeky nerd living in a ground floor flat where strangers frequently call looking for directions. This was an exciting proposition dripping with potential for Kirby’s engaging humour so when the doorbell finally rang I was disheartened to find it was just his girlfriend’s dreary best friend and her baby. From then on the story got bogged down in trying to produce something obviously meaningful. I wanted Kirby to just let loose with mayhem perhaps with the arrival of someone as outlandish as a mass murderer, a rain soaked politician or even a transvestite door to door salesman. Humour is Kirby’s weapon and, I believe, used effectively could be just as successful as any “serious” attempt at writing. According to Legend Press Kirby is now currently writing a situation comedy. So good luck to him in his endeavours he has the wit, he just needs to go into freefall with the imagination. Of course, imagination is a principle factor in developing any story but I didn’t feel either Miranda Winram’s tale of a burns victim or Rebecca Strong’s one of an unborn child were particularly creative. In fact they imbued me with the image of an angst ridden female’s writers group. (Ugh.) While the sentiments of both stories are praiseworthy and no doubt will find many female admirers they didn’t appeal to me. Perhaps it also didn’t help that the real action in these stories took place, or had taken place, outside the “rooms.” (The foetus reacts to what’s going on outside the womb and the burns victim is already injured when we encounter her in her hospital bed.) In the more successful stories the action/conflict was more obviously centred within the room although in C J Carvers story the action cleverly took place using a moving room (the railway truck) which enabled her to tap into all sorts of memories and emotions without it appearing overly contrived. So 8 Rooms is very much a mixed bag and like the rooms in my house, some stories were neat and orderly, some were messy and some looked good on first impression but on closer inspection didn’t live up to expectations. Maybe with a little bit more handiwork, some décor and a few finishing touches this book might have been a collection of truly memorable rooms rather than one where some of the rooms needed a little more love and attention. Blimey still no comments here? Has no-one else read it? Or shall we just get a beer and sit and watch the tumbleweed blow through? You will not be surprised to hear that I agree with your take on this collection of stories, particularly the idea that they would have benefitted from a bit of rigorous editing before being offered to the buying public. It may not be my most insightful comment ever, but basically they were too long. And a bit indulgent. Less really can be more. No bedroom story? That's where the secrets gets spilled.